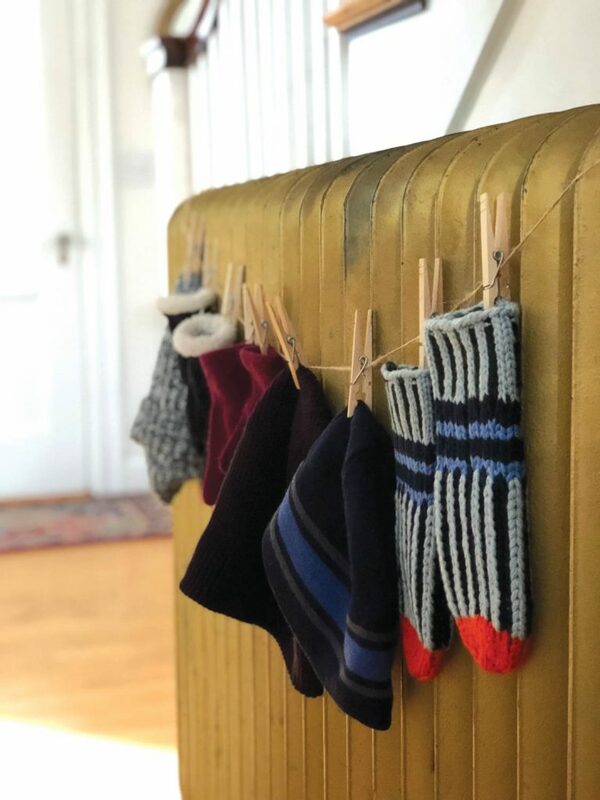 How is it that every winter, despite my diligent efforts and family-wide reminders, I am constantly picking up mittens, hats, jackets, boots and scarves from all over the house? I’ll tell you why: Because there is no good place to put this stuff. 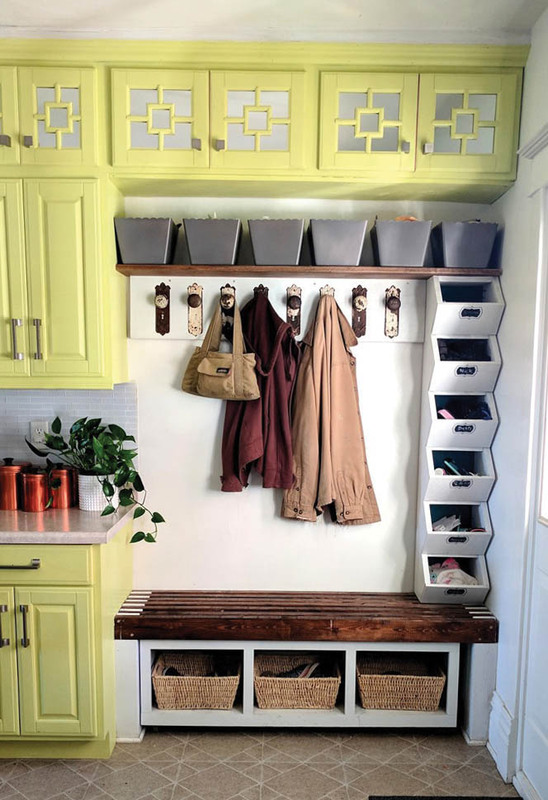 In a clutterless world, we would all have spacious coat closets or mudrooms stacked bottom to top with well-planned, ergonomic, space-saving storage. Oh, to be so organizationally blessed. If you live in an older home like I do, you may not even have an entryway, never mind a well-placed coat closet. You open the front door and—boom!—you’re in the living room. If there is a closet, it may be tucked under the stairs, so all the winter gear has to travel, snow and all, down the hall. So, how do we maximize the space we do have in order to minimize winter clutter? This season, I was determined to make the most of the two coat closets in my small entryway. They’re shallow, about nine inches, not deep enough for adult man-boots or hangers. And the closets are wider than their doors, which creates pockets of impractical space on either side. For years I’ve made do with an added, also narrow bookshelf I found at Goodwill but it cuts off access to the right and left nooks—and has me doing acrobatics to reach lost objects when they fall into the abyss. I decided the only way to really utilize that peripheral square footage was with full-width shelves. Mine are made of pine, cut to size at Lowes, with simple screwed-in legs for stacking. Man-boots can fit sideways, and the side nooks work for footwear that isn’t worn daily. Finally, every inch is doing its part. If you have no closet of any size in your entry, the key is to store items vertically, maximizing height and minimizing depth. Ladder-style leaning shelves can hold baskets for loose items, and boots can often fit on the bottom shelf. Consider lining a simple plastic boot tray with beach stones to collect melting snow. For motivated DIY-ers, one of my favorite vertical solutions comes from Bethany at realitydaydream.com. Search “mudroom cubbies” on her site and you’ll find step-by-step instructions for a versatile cubby unit. The unit works in an open-plan mudroom or mounted on a wall next to the door. The cubbies are open enough to easily locate matching mittens, but the solid fronts give a tidier appearance. If you’re ready to tackle storage woes with a more permanent solution, I recommend a visit to the Closet Factory on Riverside Drive in Portland. President Walter Munsen and his team build units to order on-site. Unsurprisingly, Munsen says when it comes to storage, New Englanders are “heavy on the efficiency scale.” We like to utilize every inch, and Walter’s team is used to working in small spaces and accommodating odd sizes, slopes and angles. With as little as 12 inches of depth, they can build a bench with cubbies and hooks for around $700, depending on the finish details. 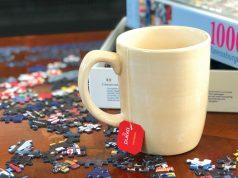 They build free-standing units too, and Munsen’s favorite component are metal pull-out baskets. “Kids love them,” he says. “They’re fun and easy to use, and they’re less expensive than drawers.” Also, they allow wet clothes to dry. With a little ingenuity and a trip through the Pinterest archives, there are plenty of ways to keep winter accessories tidy. And just think, in a few months we can load up our new cubbies with flip flops, sunscreen and beach toys. Repurpose an over-door shoe holder for soft-accessory storage. Choose clear plastic pockets to make mitten matching even easier. Mount two small drapery bars (or wooden dowels cut to fit) on the inside of a closet door using damage-free hooks. Clip mittens and hats to the top bar using curtain clip rings and hang scarves over the lower bar. 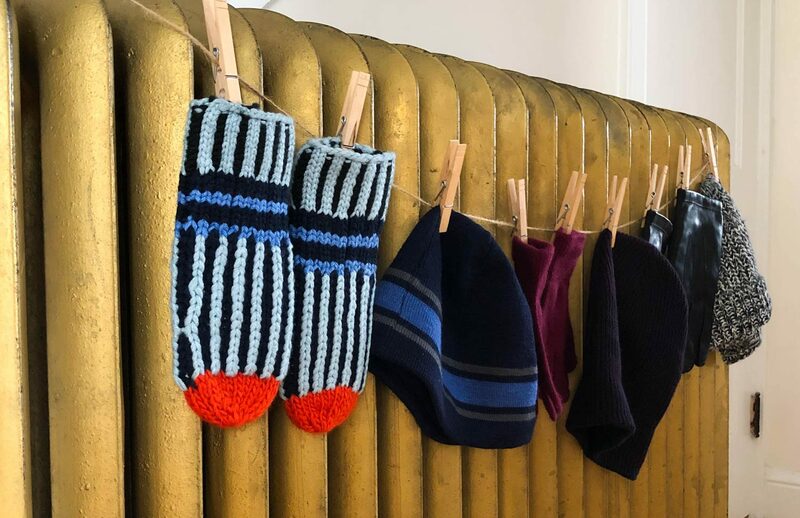 Make an accessory garland by attaching ribbon or twine strung with wooden clothespins to the sides of a radiator for roasty-toasty outerwear (and tuck the garland in a drawer when things are dry). Rectangular silver mesh file holders for the office can be repurposed for storage. With a few screws they are mountable, and because they’re narrow, they work well in tight spaces. Assign family members his or her own holder based on how high each person can reach!